Route. 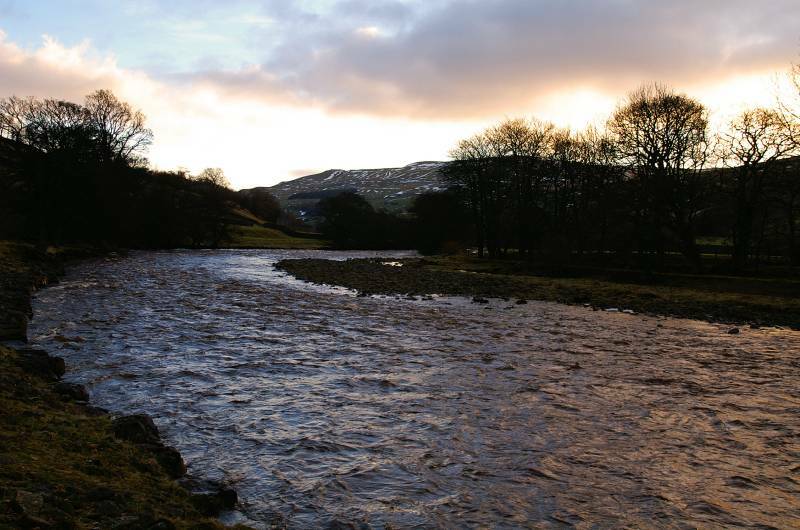 Muker - Ramps Holme Bridge - Ivelet Bridge - Ivelet - Gunnerside - Gunnerside Gill - Blakethwaite Smelt Mill - North Hush - Lownathwaite - Swinner Gill - Crackpot Hall - Ramps Holme Bridge - Muker. Notes. 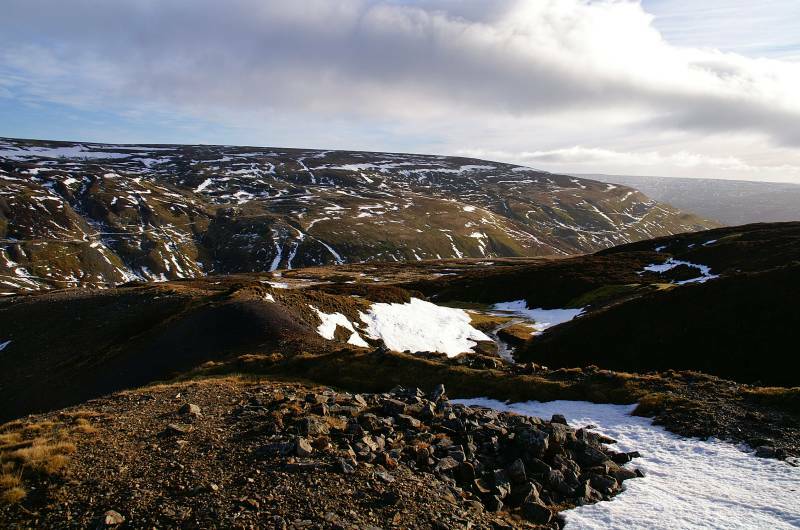 Today on a cold December morning let me take you on a walk through the pages of Yorkshire's Lead Mining Industry, a stroll through the ravines and hushes of Gunnerside Gill, where on a quest for vast riches man has driven shafts and adits into a pristine Yorkshire landscape to create the desolation we see today. 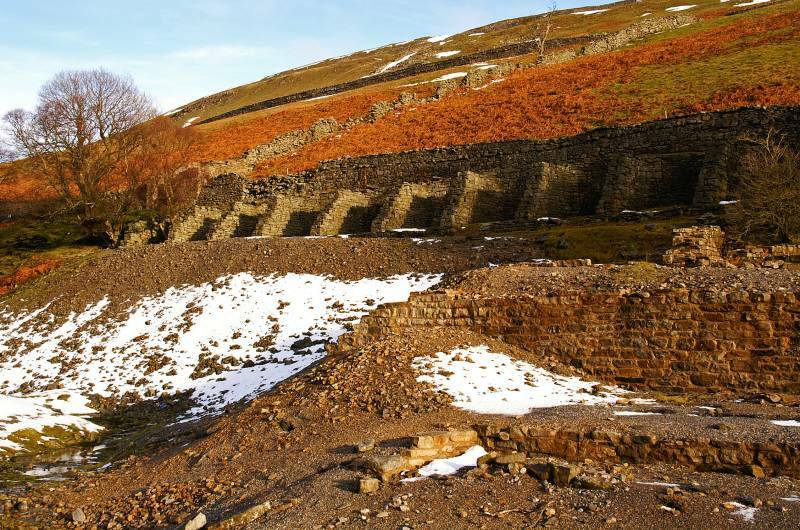 There aren't many places you can visit in the Lakes and Dales where the scars of early industry aren't visible, but there is nowhere quite like the deep side valley of Gunnerside Gill, a stark reminder of a past way of life, some would say the good old days, well on a day like today with the deep ravines and hushes full of snow I just have to say I'm glad I wasn't around in the good old days. This turned out to be a 56 stile walk, give or take a few, I left Muker on a paved path, wandering through meadows to Ramps Holme Bridge, I crossed to be met by a finger-post directing me to Gunnerside, is anyone counting I've already reached eight. 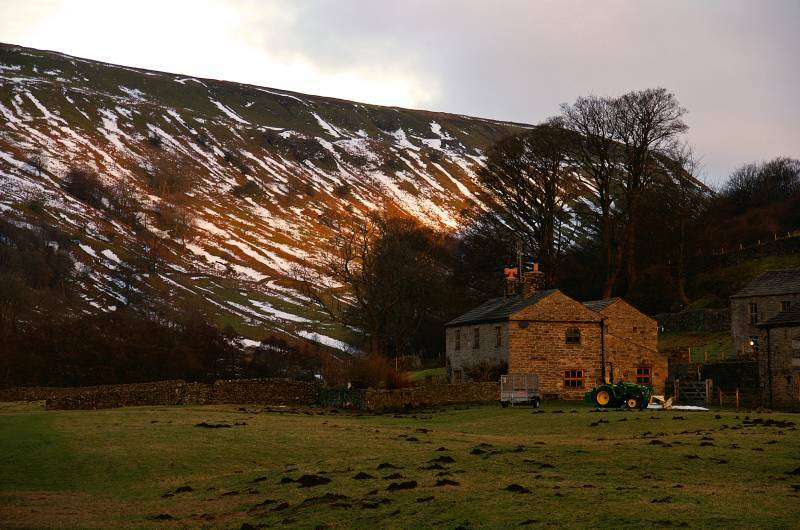 An easy ramble followed through pristine pastures wandering along the banks of the idyllic River Swale, crossing fields bordered by dry stone walls and barns, typical of Swaledale. I passed the perfect proportioned Ivelet Bridge before a short stretch of tarmac lead into Ivelet village, here I crossed the deep gorge cut by Shore Gill to enter more Swaledale pastures. Fourteen stiles later but less than a mile I entered Gunnerside village, I crossed the road bridge to start a walk through the pages of the industrial history books, the finger-post read Gunnerside Gill, with no hint of the devastation laying ahead. 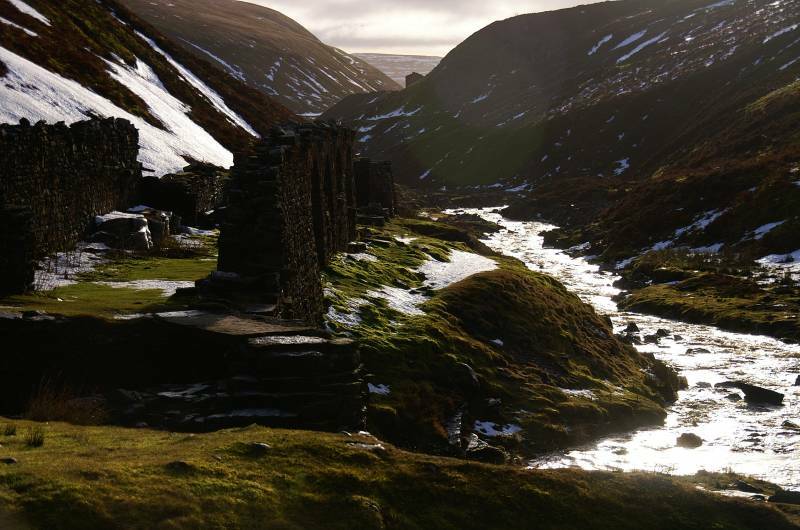 The next three miles saw me wandering through the specters of Swaledale's industrial past, the relics of lead mining scarred the landscape. I passed the ghostly remains of mine buildings, wandered over dressing floors, passed bouse teams and adits, ravine like hushes scarred the hill side. On reaching Blakethwaite Smelt Mill (not named on the OS map) I stopped to soak up the atmosphere and have a brew, anyone interested in industrial archeology will think they've just died and walked into heaven. 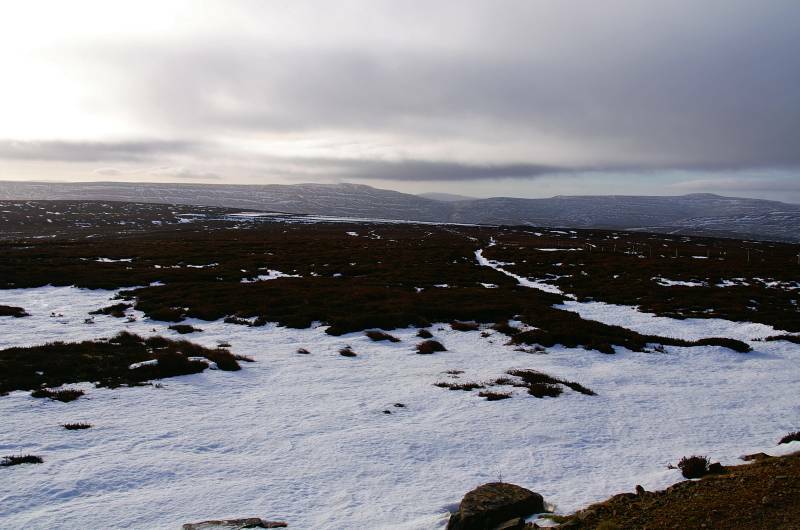 From Blakethwaite I ascended the North Hush to access a land rover track that would guide me over the moor. I followed this track to East Grain where a path fords the beck to descend Swinner Gill, following marker posts over wet ground I descended passing Swinnergill Smelt Mill before reaching then crossing a delightful little bridge over Hind Hole Beck. 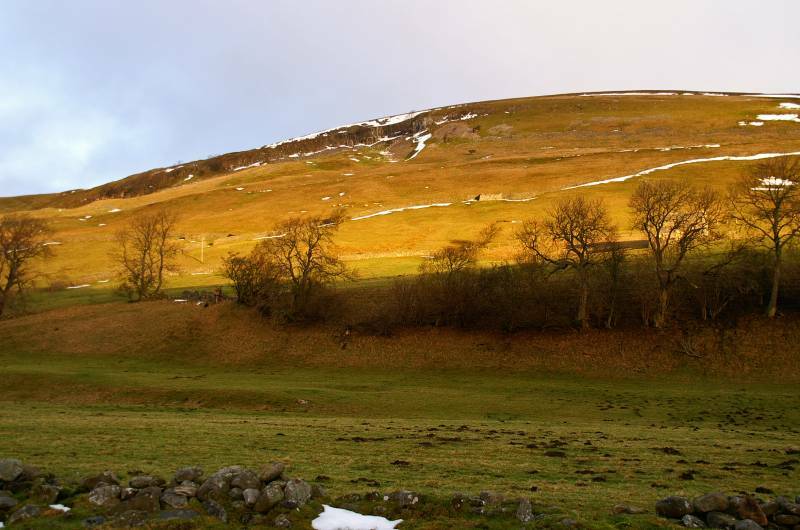 Here a finger-post invited me to Keld or Muker, I followed the high path to Keld, passing under Buzzard Scar, I had one more visit to make before turning south to Muker. 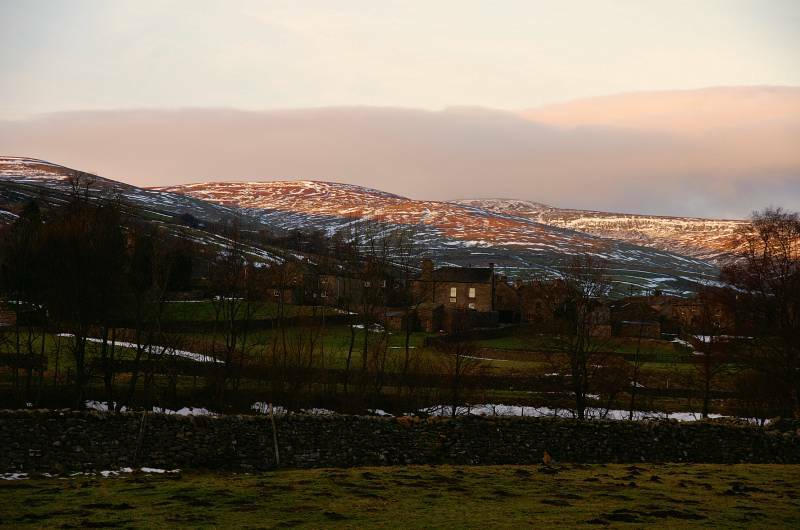 Anyone fancy living in a place called Crackpot Hall, it'll suit me fine, this 17th century farm house and hunting lodge stands proud above Swaledale, commanding stunning views to the north and south. Once a prized peace of real estate now abandoned due to land subsidence caused by mining opperations, it's still an atmospheric place with a feel all of it's own, well worth a visit. 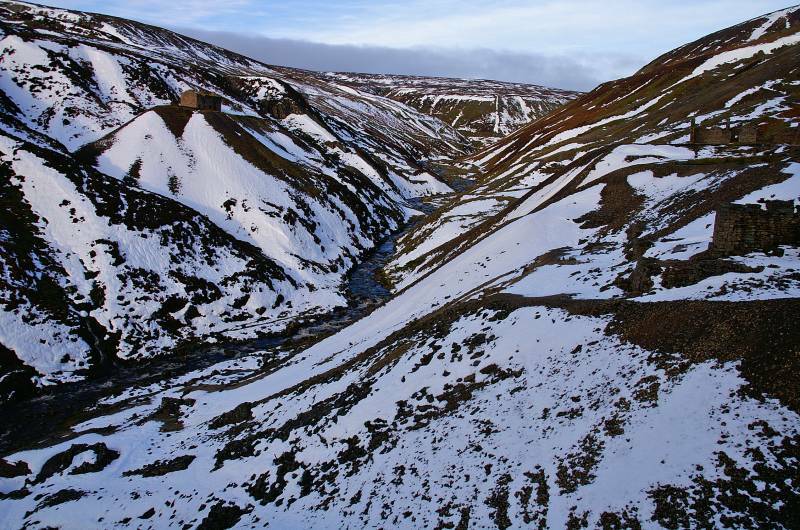 My visit over I descended to the valley floor taking the first path on my left, this follows the east side of the dale under the scars of Arn Gill, passing the spectacular cascades of lower Swinner Gill before reaching Ramps Holme Bridge for the second time. All that remained was to re-trace my steps over the eight stiles and paving slabs between the bridge and Muker. 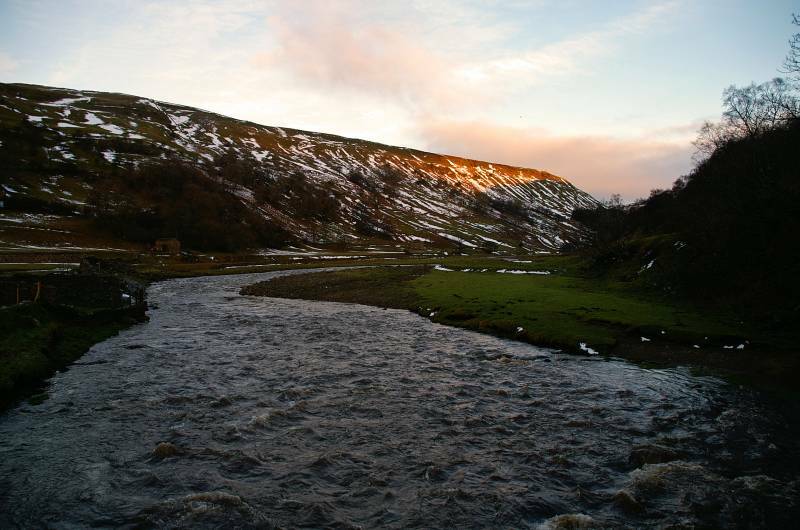 The golden glow of morning just catches the Swaledale flanks of Kisdon Hill, seen from Ramps Holme Bridge. Towering above Ramps Holme Farm, Kisdon Hill. Looking to Great Shunner Fell above Muker. 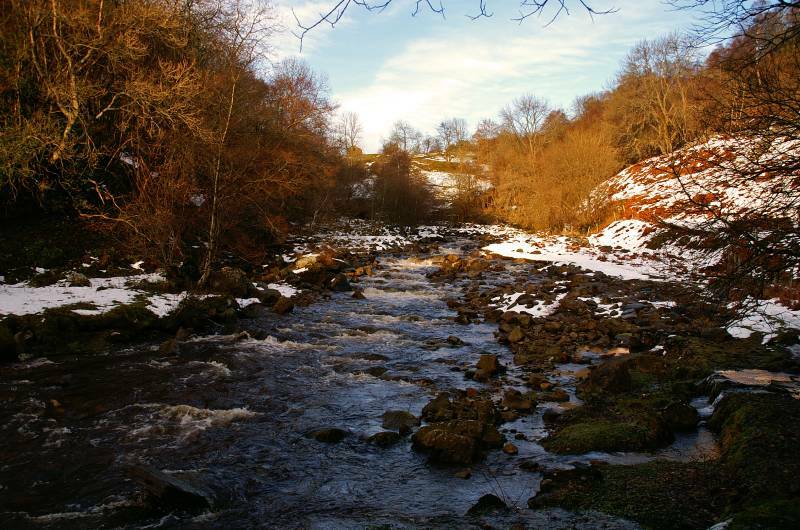 The River Swale swollen by melting snow. 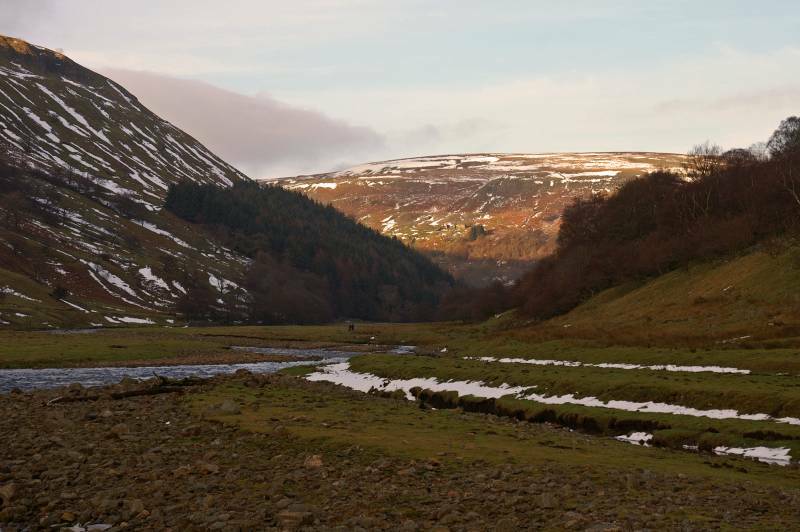 Seen from the banks of the Swale, in sunlight and shade Kisdon Hill. Lit by the morning sun the Kisdon Scar face of Ivelet Side.. 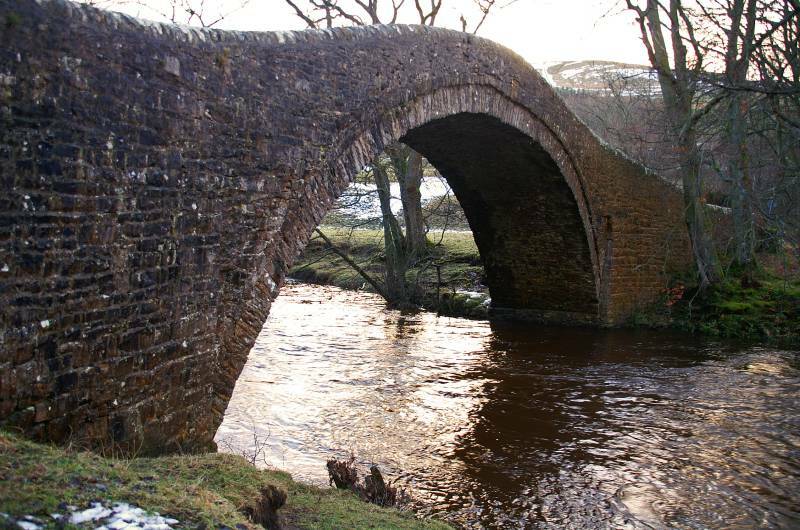 Built in 1695 the perfect arch of Ivelet Bridge, local folk law tells us it's haunted by a headless spectral hound. 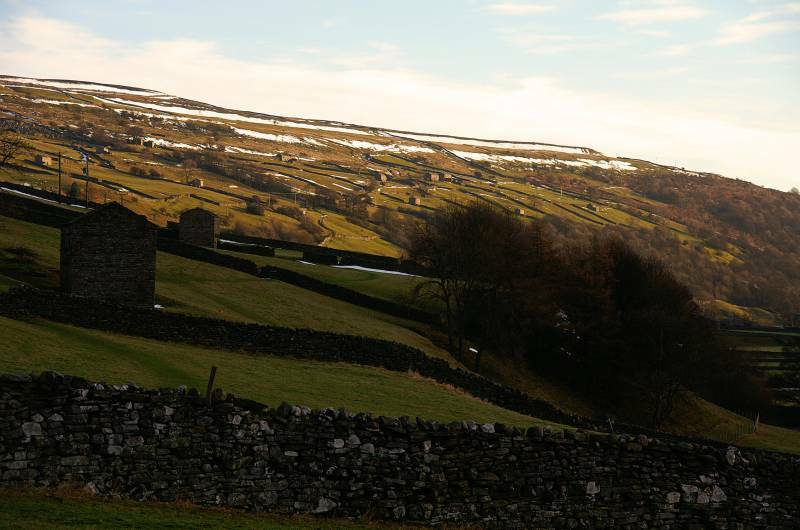 Typical Swaledale scene, dry stone walls and field barns, built in the late 18th early 19th centuries. 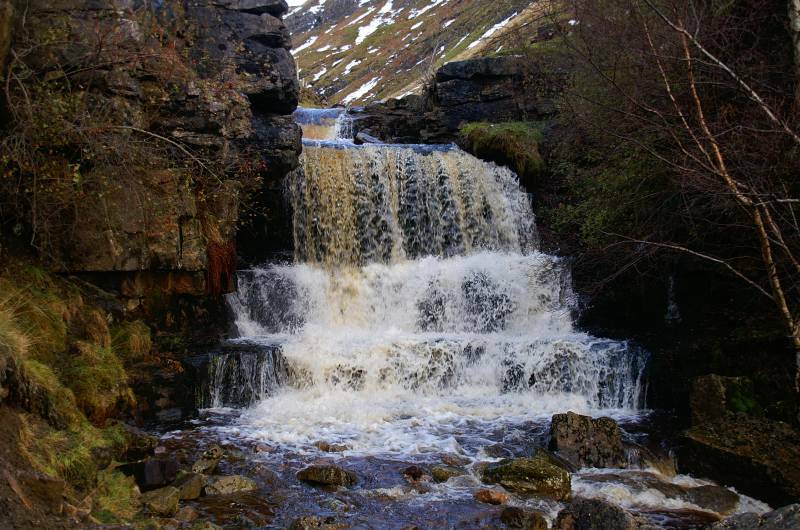 The entrance to Gunnerside Gill, Birkbeck Wood bars the way a curtain raiser for things to come. On the approach to the Sir Francis Mine, about to descent to the valley floor. A fine set of Bouse Teams, used to store the lead ore (galena) before cleaning and dressing, seen from the Dressing Floor of the Sir Francis Lead Mine. Walk a little further up the gill and this scene of utter devastation bursts on the senses, The scars of the hand of man, on the right the Bunton Mine and on the west bank the Lawnathwaite Lead Mine. 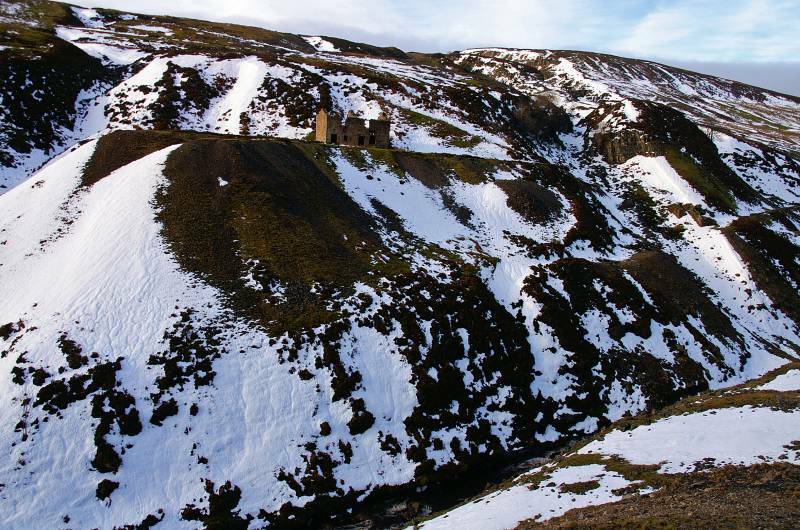 The Lawnathwaite Lead Mine and the North Hush seen from the Bunton Dressing Floor, why Hush? because the impact of a Hush in action can have been anything but quiet. 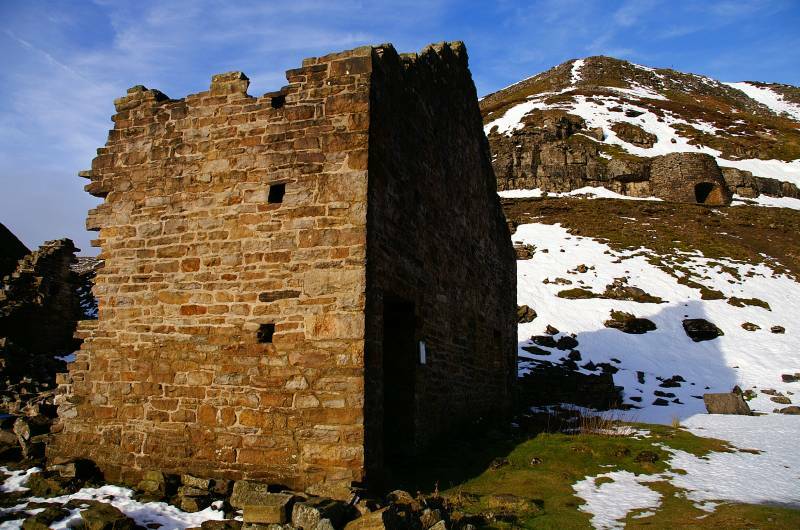 The Blakethwaite Peat Store, Peat needed to fuel the twin ore-hearths at Blakethwaite was cut and dried on the moors above. Once dried it was sent down to the peat store on a peat slide that ran down the side of the fell, it was stacked for use in this open sided building. 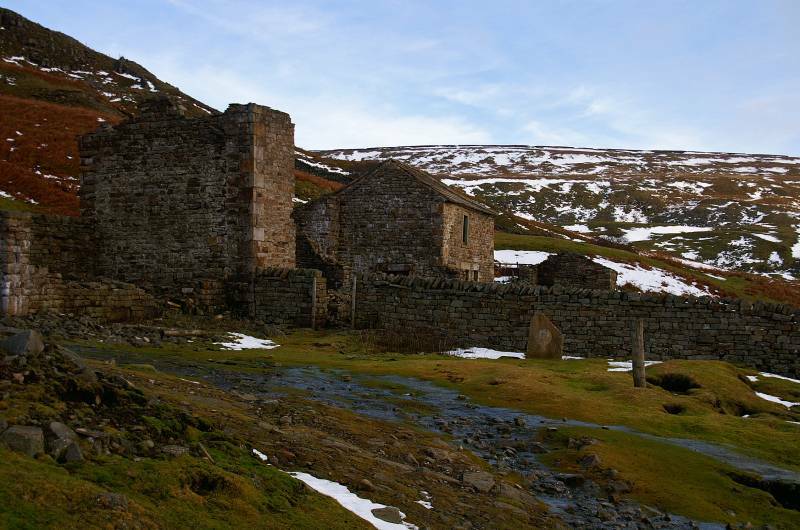 Blakethwaite Smelt Mill, built to cope with increased production in the 1890s, the mill was blessed with two ore-hearths to cope with ore supplied from the Blakethwaite and Lownathwaite Mines. I've just scrambled out of the North Hush, looking to Melbecks Moor, the three scars from the centre to the right of the picture are the Gorton Hush, Friarfold Hush, almost out of shot the Bunton Hush. 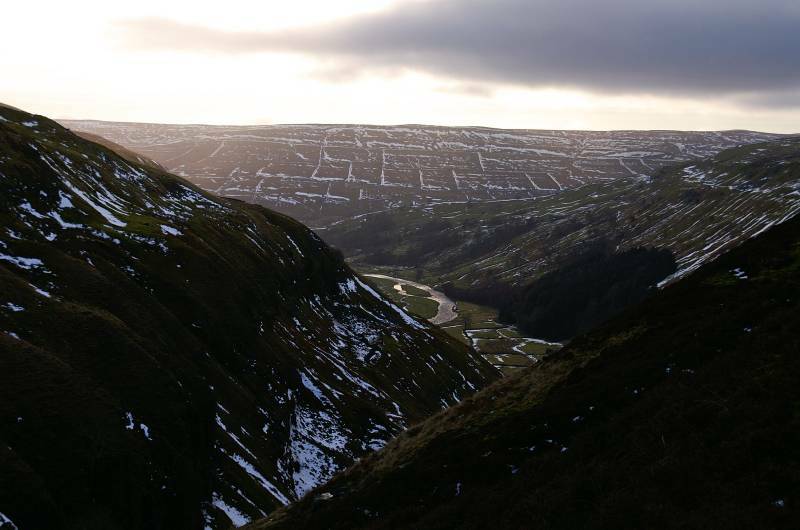 Across the divide of Gunnerside Gill, Melbecks Moor seen from the top of the North Hush. 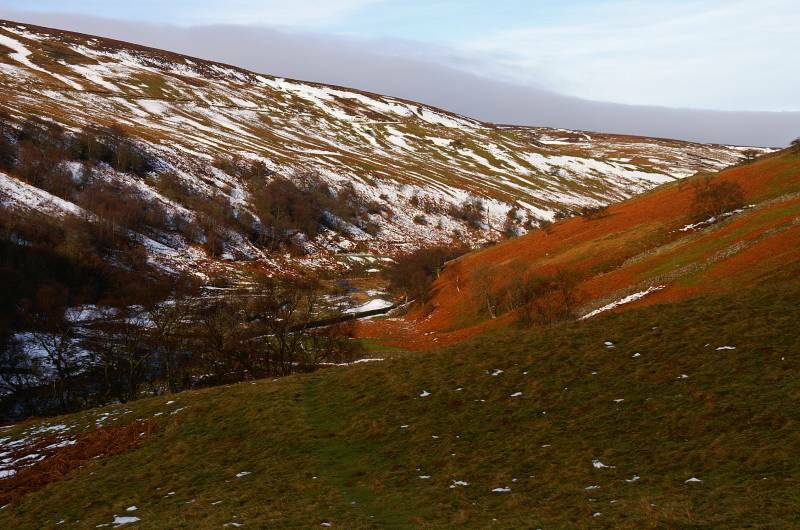 Striding out through Yorkshires broad acres, looking to the Butter Tubs Pass between the slopes of Lovely Seat and Great Shunner Fell. 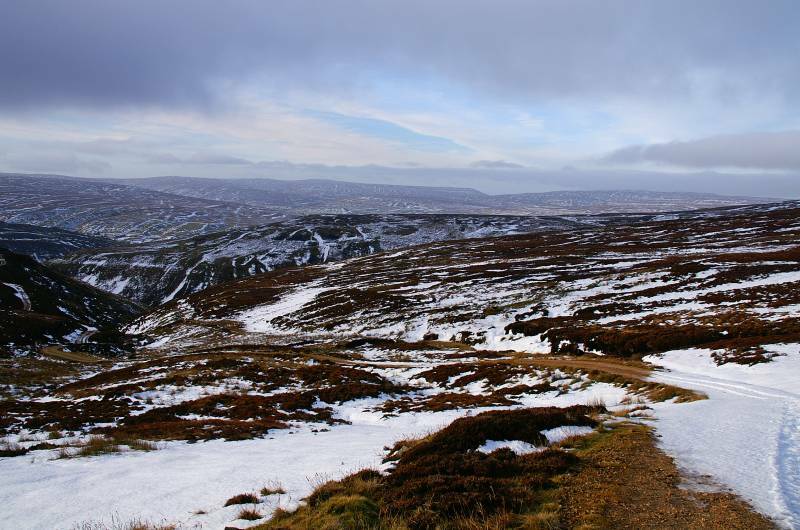 A stunning panorama over an icy wonderland, high above Swinner Gill looking to the Wild Boar Fell skyline. 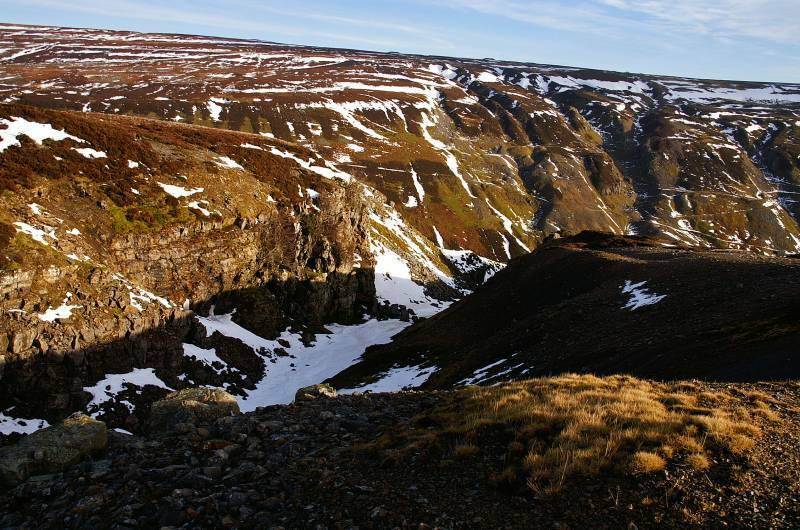 Looking down into upper Swaledale from the dizzy descent of Swinner Gill. 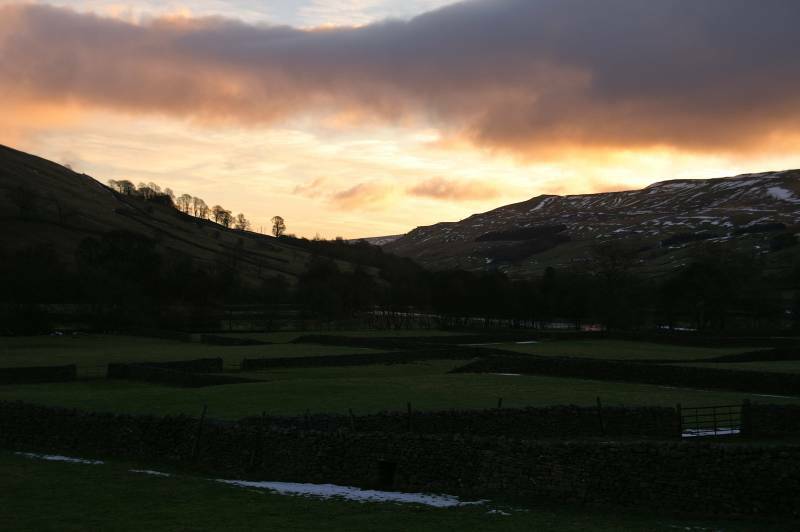 The sad remains of Crackpot Hall. 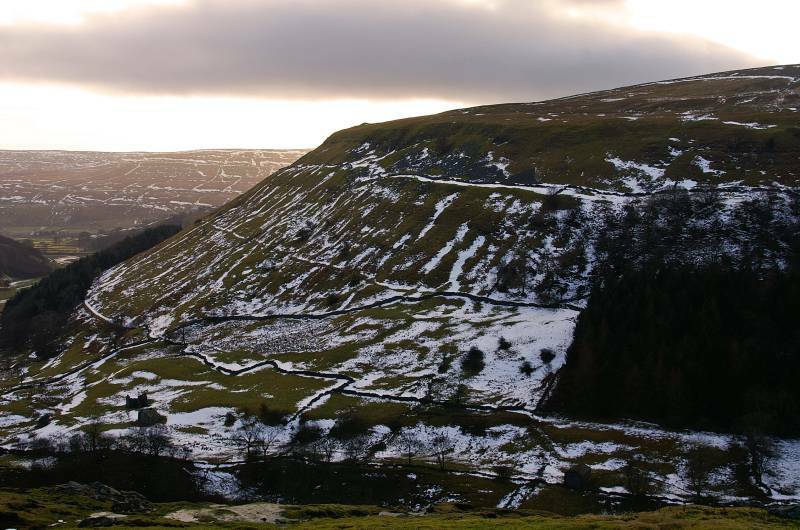 Kisdon Hill as seen from Crackpot Hall. 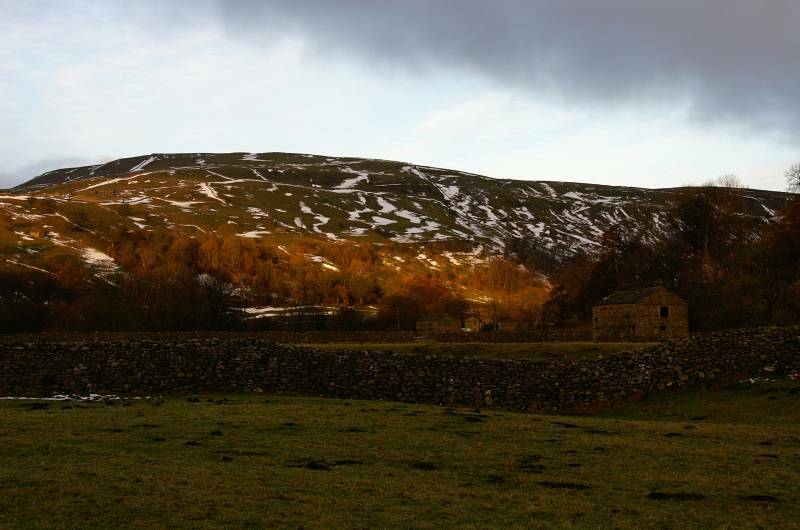 View taken over upper Swaledale, in sunlight Hall Moor with the steep slopes of Kisdon Hill to the left.